After Iraqi forces moved in to oil-rich Kirkuk over the weekend, Kurds have started fleeing the disputed area, some heading for the Kurdish capital of Erbil, 60 miles to the north, per NPR. Prime Minister Haidar al-Abadi said it was necessary to send in troops to "protect the unity of the country, which was in danger of partition"— this comes about a month after Kurds voted overwhelmingly for independence, a vote al-Abadi said was unconstitutional. The U.S. factor: The U.S. supports both the Kurdish forces, the Peshmerga, and Iraqi government forces in the fight against ISIS, and has provided both sides with weapons. The U.S., like Baghdad, opposed the Kurdish referendum vote and today the U.S. Embassy in Baghdad stuck to the State Department line, urging all parties to remember "ISIS remains the true enemy of Iraq." Big picture: Recall, the Peshmerga took over Kirkuk in 2014 after ISIS knocked out the Iraqi army in the area. The latest developments indicate that areas captured from ISIS are ripe for conflict over territorial control, per the BBC's Jonathan Marcus. Baghdad can say it's returning things to the way they were before ISIS, but the Kurds can claim majority support. Iraqi forces have moved into airports, a military base, and into major oil fields near the city. Kurdish party headquarters have been abandoned. 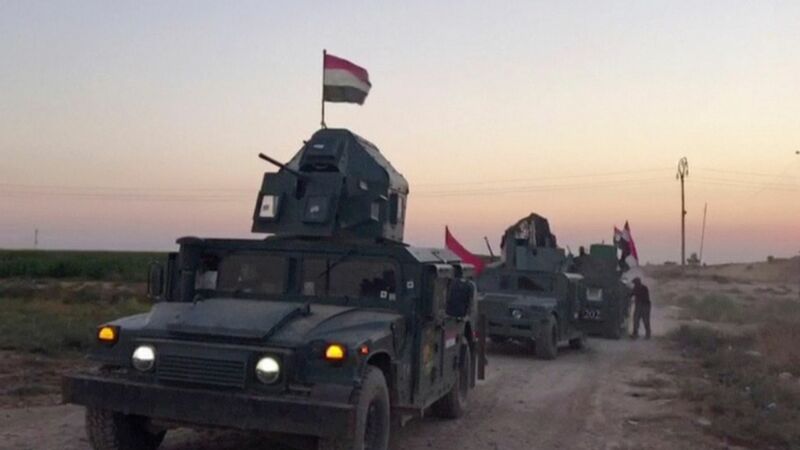 Kurdish officials said the Iraqi army had launched a "major, multi-prong attack," reporting clashes on the outskirts of the city, including burnt houses and "lots of casualties," per Peshmerga spokesman Brig Gen Bahzad Ahmed, although the BBC notes the account couldn't be verified. Peshmerga general command said Abadi's government "should pay a heavy price" for its behavior. The Iraqi government claimed the PKK, Turkey's Kurdish insurgents, had arrived in Kirkuk, and said that would be tantamount to war, per the AP.